Now I’ve never been over fond of the eastern side of town, Heath Town and Wednesfield in particular, and perhaps the reason for this stems back from a tiresome day spent during the summer of 1944 of which I still recall to this day. 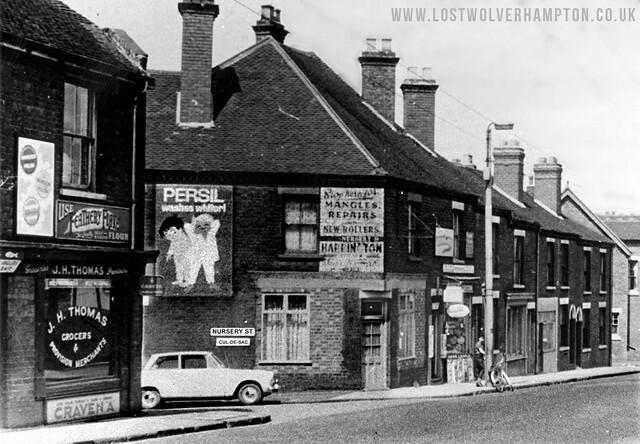 At that time during the war, Wednesfield was a real Black Country Village the High Street consisted mainly of pubs, small shops, and terraced houses, all this surrounded it seemed by open countryside. Not many of the old buildings with the exception of St Thomas’s Church The dog and Partridge remain today. 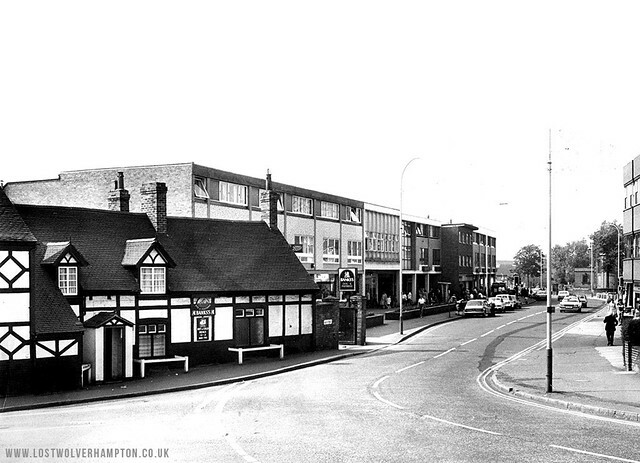 Heath Town public baths Tudor Road Heath Town. 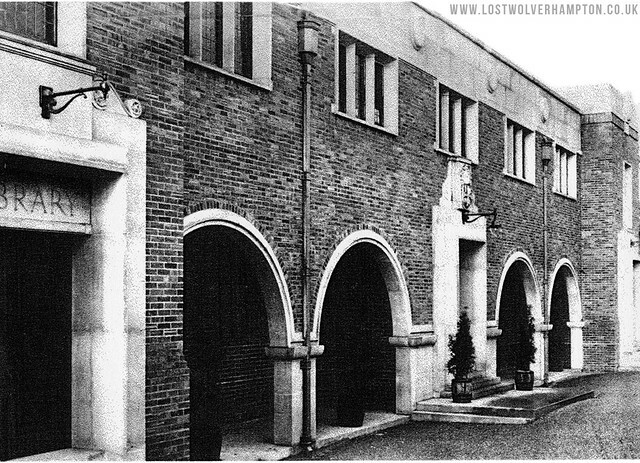 Heath Town Baths were opened on 16th December 1932, The Children’s Swimming Bath was 40 feet long by 25 feet wide ranging from a depth from three feet to three feet three inches deep. My story starts in the summer of 1944 had just had my 7th Birthday and my best friend at that time was Brian Dade three years older than me who lived next door. I don’t know how he managed it but as a treat, he had convinced my mom to allow me to accompany him on what was going to be my first visit to the swimming baths, not the Central Baths, just a walking distance from my home in Nursery Street, but the ones at Heath Town. “The water is only 3ft deep in the little baths at Heath Town, he said; and he can borrow some trunks and a towel off me “. So clutching the sixpence mom gave me, of we went. The paddling pool on Upper Green Tettenhall. 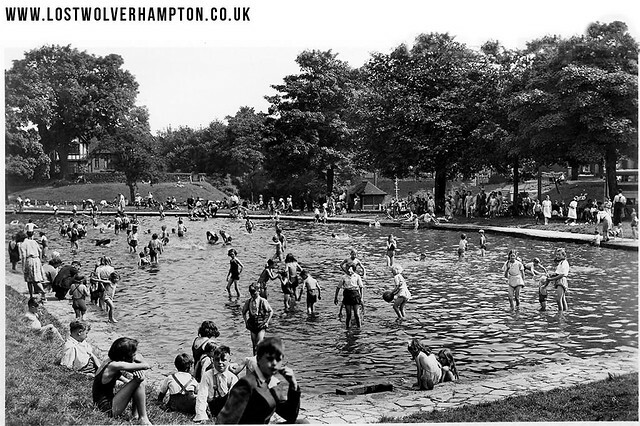 The former Stockwell Farm, duck pond was converted into a paddling pool in the 1930’s at the expense of the Graham family, the owners of the Express and Star. Up to then my only experience in water besides my weekly splash in our old tin bath on a Saturday night had been in the 2ft deep paddling pool, at Tettenhall Rock. So you can imagine how excited I felt at the thought of treading this new ground. 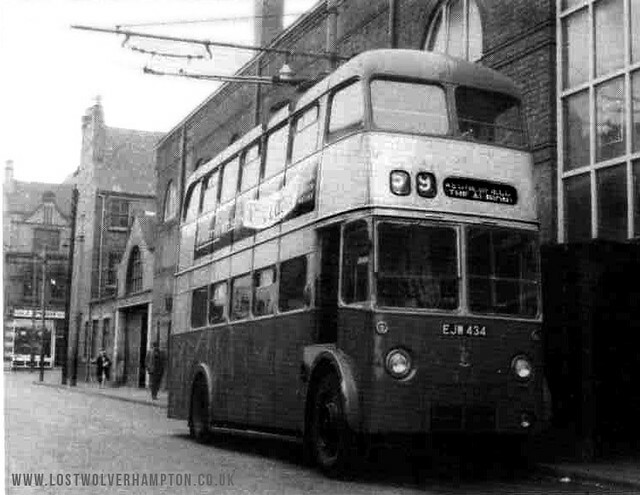 By 1944 – I had watched the Wednesfield bus arrive and depart from its terminus in Thornley Street many times on Saturday afternoon sessions of the children’s matinees at the old Olympia picture house opposite. But that was it. I had never ventured further down Wednesfield Road than Broad Street basin and the Low-Level Station. But this day I was about to do just that. The outcome of which, would turn out to be, a never forgotten experience. 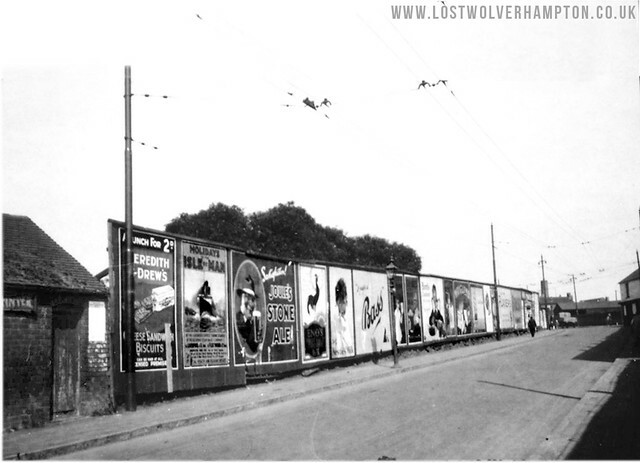 The Hoardings fronted the Old Junction Railway and tunnel entrance under the Wednesfield Road Heath Town. We walked the short distance to Thornley jumped on the waiting trolleybus and the bus soon arrived at our designated stop just past the junction of Tudor Road and Deans Road, where we walked the 100yds or so to the baths entrance. The earlier feeling of euphoria though was soon to be replaced by a sense of foreboding as we entered the baths,the whole place seemed cold and damp and there were no cubicles left just a small changing area. The swimming trunks Brian handed me were made from wool, and once I entered the freezing pool (No heating at that time ) they hung from me like a damp dish cloth. Now in just a matter of minutes, I about realised I didn’t enjoy swimming, and in these baths never! I think at this point I became a pain in the neck for Brian; who had now met a couple of friends and was really enjoying himself. He tried everything he could to offset my discomfort but I wasn’t having any of it. I’d had enough and made up my mind, ‘I wanted to go home. With no more to do! Brian quickly helped me dress and with a curt “You’ll be okay, you know the way home” I went on my way. 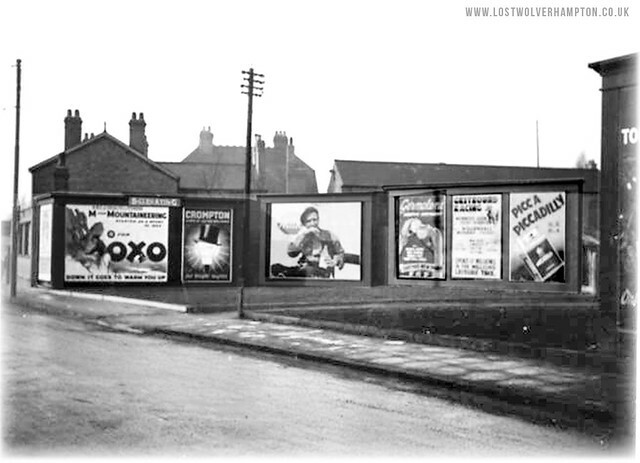 Further Billposters divide the passageway which went from the Baths at the rear of the houses in Tudor Road to the bus stop at that time. I was so pleased to be out of that cold damp place and the sun was shining and as I skipped up the alley at the side of Church Rd, I saw a bus coming and quickly jumped on it. The conductor enquired “going all the way”? and when answered yes, gave me a penny fare. I thought this wasn’t right at the time because it had cost one and halfpence to get here, but anyway, I said; nothing. When the bus emptied at the end of the short journey it was at a place that wasn’t at all familiar to me . This wasn’t the Drill hall in Thornley St, this was a place I’d never seen before . The problem was brought about by my failure at the Heath Town to cross the road to the other stop, the one for the town, and I had been carried on the same bus route I’d come on straight to the terminus at Wood End Road, Wednesfield. It was very quiet at that time, it would have been around two-thirty when the bus had gone I was left standing alone. Now, instead of waiting and asking someone the way, I made the fatal mistake of walking along the road looking for a street or place I’d recognise ( It must be noted here that there were no signposts around at this time, these had all been removed in case of enemy Paratroopers landing, and traffic was scarce anyway on the roads during the war ). Now, the 200yd stroll at the end of what should have been my short bus journey home turned out to be a four to five-hour marathon trek, and although I did spot streets with familiar names like Wolverhampton Road and Stafford Street, they didn’t seem at all familiar to me. I do recall though passing a country market. 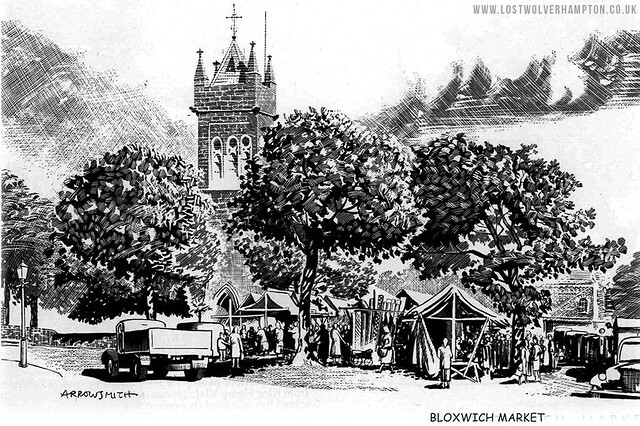 I was later to find out, I had passed through Bloxwich. 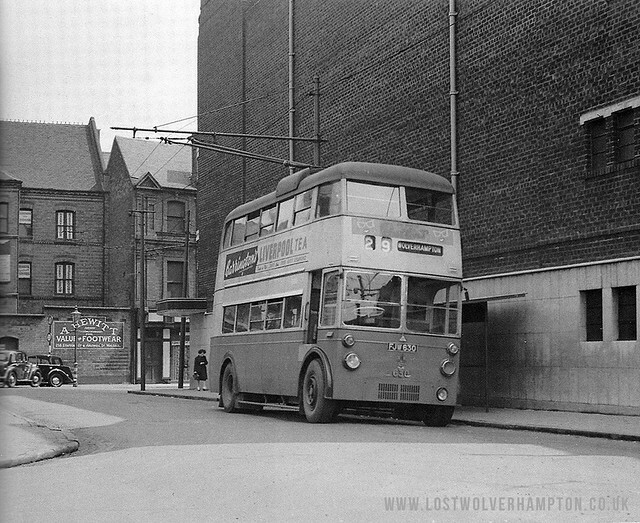 Walsall Bus Terminus at the rear of the Savoy Picture House. Feeling really tired and miserable, I finally reached the hustle and bustle of a town. I approached a queue of people and asked’ “where am I?” and a gentleman told me “You are in Walsall”. I poured out my story to him telling him I was trying to get home, to Wolverhampton and he took me to the stop explaining to the conductor my position who must have took pity on me because he let me travel the full distance for my remaining Halfpenny. 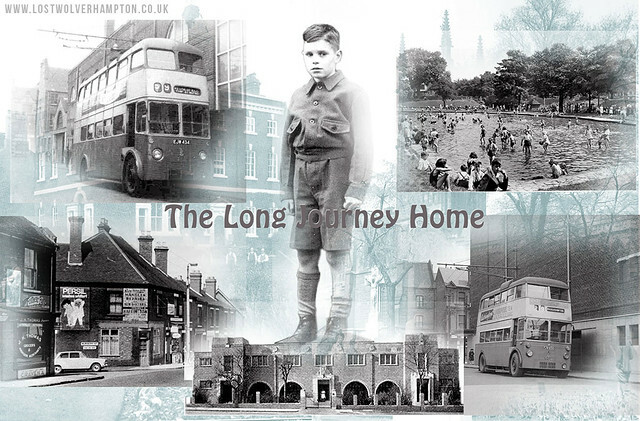 You can imagine the happiness I felt when the bus passed the Displaced Persons Huts by St Matthews Church on the Willenhall Road, these places I knew because my grandparents lived in Colliery Road. Finally, we reached the top of Horseley fields and I was home. I raced across town, and down Stafford Street. It was still quite light as I turned into Nursery Street. My mother was standing on our doorstep with some of our neighbours who had been out looking for me. Then after the initial shock of my sudden appearance and my explanation of what had happened to me had passed, I was fussed over by all except Brian who didn’t speak to me for quite awhile, and needless to say I never went to Heath Town Baths again.